Rat mothers that nurture their pups aren't just being good moms -- they're also influencing how the babies' brains form, according to a new study in the journal Current Biology. 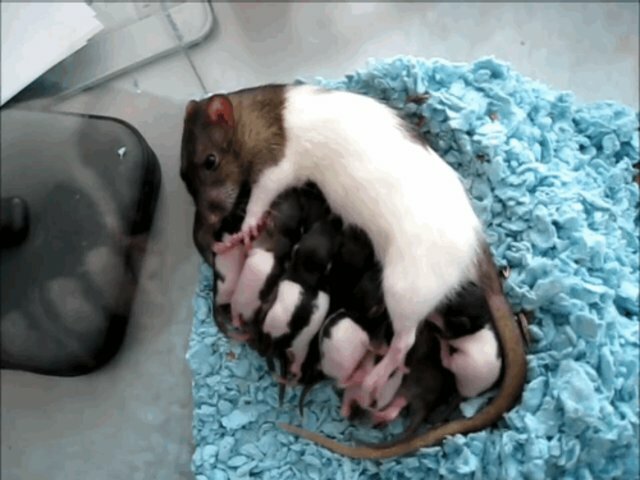 When researchers at New York University monitored half a dozen rat mothers and their newborns, the scientists discovered the pups' brains had bursts of activity as they were groomed or fed. In mammals, a mother's sensory stimulation -- such as keeping the young warm or providing milk -- "helps sculpt and mold the infant's growing brain," Regina Sullivan, a neurobiologist at NYU and an author of the study, says. The researchers observed nearly 100 hours of video as mama rats cared for their pups. By simultaneously monitoring the rats' brain functions, the biologists report that neural activity during grooming increased by about 100 percent. There were similar upswings when the pups drank milk, and also changes when the mom left the nest. It's not just young rats that can benefit from a caring mom. For all mammals, the first stages of life are critical for neural development, as permanent pathways are hard-wired into our brains. "The study also helps explain how differences in the way mothers nurture their young could account, in part, for the wide variation in infant behavior among animals, including people," Sullivan says.